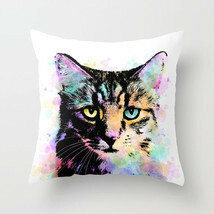 This is a throw pillow case with an image printed from one of my original creations. Available with or without the insert. If you want only the pillow cover without the insert, please select the size with "case only". If you want the complete pillow (case insert) please select the size with "INSERT". This throw pillow case is made from 100% spun polyester poplin fabric. Individually cut and sewn by hand, the pillow cover is available in 3 different sizes, 16x16 inches, 18x18 inches or 20x20 inches. It features a double-sided print and is finished with a concealed zipper for ease of care. Made to order and shipped from USA. Please allow a few days for production before shipping. Colors on the actual item may slightly vary from the image on your device due to your device settings.